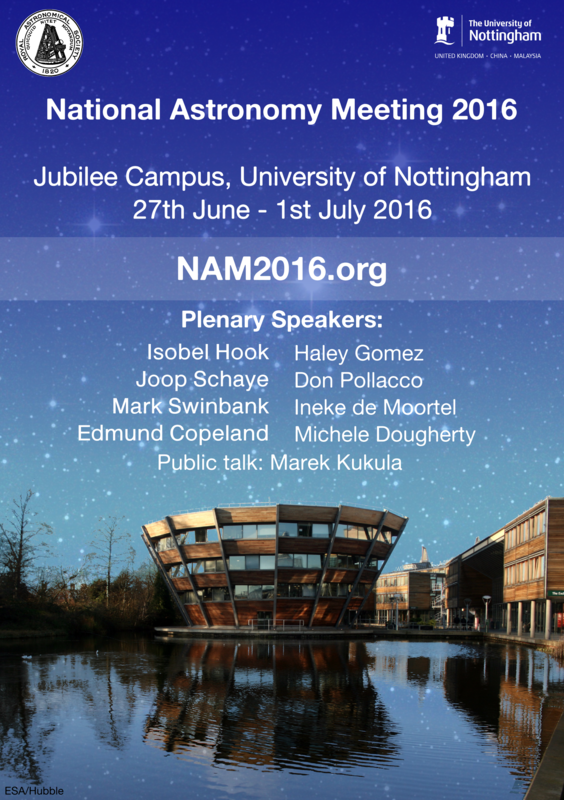 The Royal Astronomical Society is proud to present the National Astronomy Meeting from 27th June - 1st July 2016. The meeting will be held at the University of Nottingham. We look forward to welcoming you! Other topics: Gravitational waves, modified gravity, archeoastronomy, astrochemistry, education and outreach. Conference accommodation booking for rooms on the Jubilee Campus has been extended until 1400 BST on Friday 24 June (for those needing a room from Sunday onwards) and until 1700 BST on Sunday 26 June (for anyone needing a room from Monday onwards). REGISTRATION HAS NOW CLOSED. Final preparations are being made! On site registration will take place in the Atrium (building 5) on Sunday from about 3pm, and on other days between 8:30-9am and during the breaks, in the Exchange building (building 2). Please print this before you come and put in in your windscreen during your visit.